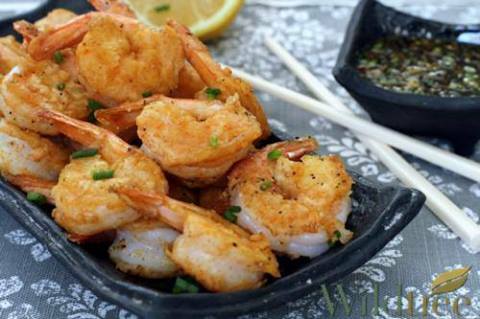 Shrimp recipes that are quick and easy using organic and all-natural ingredients as the base! There are many ways to enjoy this most popular seafood in America. For more recipes and/or shop for Wildtree products go to www.TheDinnerPlanMan.com. In a small bowl whisk together the lemon juice, soy sauce, scallion, honey, and Garlic Galore; set aside. In a separate bowl combine the flour, ground ginger, and smoked paprika. Pat the shrimp dry with paper towels. Heat a large nonstick skillet over medium high heat. Add the Grapeseed Oil. Dip the shrimp in the flour mixture, coating both sides and shaking off the excess. Add the shrimp to the skillet in a single layer and sear, turning once, until opaque throughout, about 2 minutes per side. Transfer the shrimp to a platter and serve with the dipping sauce. A winner among shrimp recipes. Preheat the oven to 425°F. Grease a sheet pan or place parchment paper on it. Dip shrimp in the eggs then thoroughly coat shrimp in Macaroon Mix and place on greased sheet pan. Once all shrimp are fully coated place the sheet pan in the oven for 8 minutes, flip the shrimp, and cook 7 minutes more. While shrimp are cooking prepare the salsa by combining the corn, avocado, scallion, lime juice, salt, and pepper; set aside. Next combine the sour cream, Chipotle Lime Rub, and lime juice; set aside. To assemble tacos divide cooked shrimp among tortillas. 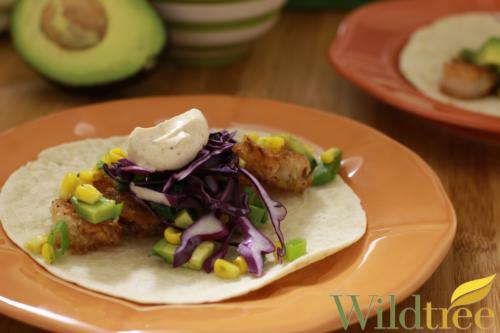 Top with corn and avocado salsa, shredded cabbage, and Chipotle Lime Rub sour cream. Allow butter to reach room temperature and mix it with the Wildtree Dill Dip Blend. Thinly slice whole red potatoes, fennel bulb, and lemon. Slice the corn into 2 inch rings. Peel the shrimp, leaving on the end tail, and cut cod fillet into equally rectangular pieces. When all ingredients are ready, prepare 2 sets of double layered tinfoil. Brush some of the dill butter on the bottom of the tinfoil then stack all in ingredients in order of potatoes, fennel, corn, kombu, cod, lemon, and shrimp, brushing each layer with the dill butter and lightly seasoning with salt. Squeeze a little extra lemon juice into tinfoil pocket. 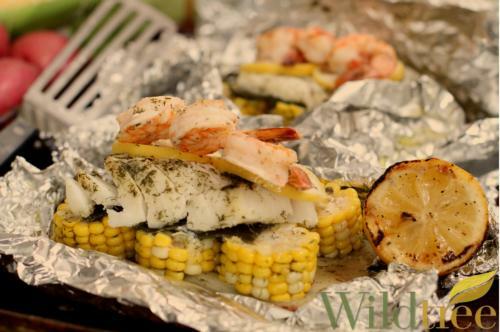 Completely close tinfoil, place on a grill at medium low heat, and cook for 15 -20 minutes until fish and shrimp are done. Seaweed is a traditional addition to a proper New England Clam Bake. The kombu is optional but adds authenticity to the dish. Shrimp recipes rock! In a large saucepan heat the Grapeseed Oil over medium heat. Add the onion, carrot, and celery and sauté for 5 minutes. Add the Garlic Galore, Chipotle Lime Rub, water, Bouillon, hominy, and diced tomatoes with chilies. Bring to a boil, then cover and lower heat to a simmer. Cooking for 7-10 minutes or until the vegetables are tender. Add the tomato juice and shrimp. Continue cooking for about 3 minutes or until the shrimp are cooked through. Remove from heat. Add the avocado. Garnish with sliced radish, cilantro, and lime wedges if desired. Keep this along with your other favorite shrimp recipes. For more shrimp recipes and/or shop for Wildtree products go to www.TheDinnerPlanMan.com. Wildtree decided to create and offer products for today's consumers. Most of us do not cook from scratch anymore and let's face it - we are a sauce from a jar, soup from a can, chicken shaking generation. Packaged foods do make our life easier, but they are also expensive, loaded with fats, salts, and preservatives, and just not as tasty as homemade. 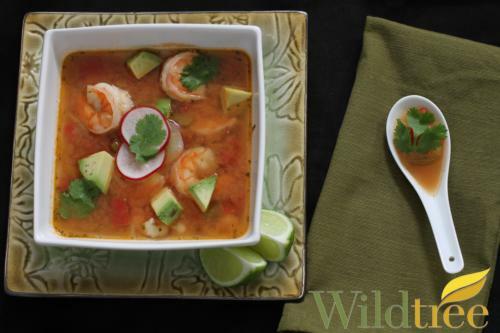 Why not rediscover cooking & healthy eating the Wildtree way for your shrimp recipes?